If you have a cotagge, and maybe a grapevine and maybe a cherry tree... then you could do this: one autumn make a grape schnaps transparent liquiud on this picture. 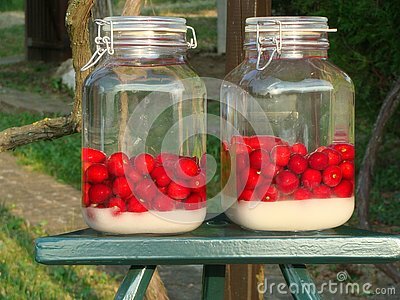 Next june, you could pick the cherrys from the tree and put them into the schnaps and add certain amount od sugar. And then wait for one year. From that day you have a new product: cherry schnaps.